Do you hold, and if elected President of the United States, would you carry out, the doctrine that the people of a Territory, before it becomes a state, have the power, under the Federal Constitution, and notwithstanding the Dred Scott decision, to prohibit or exclude Slavery therefrom? With this question before him, which he promised to answer, the Judge arose and addressed the people for an hour and a half; but for some cause or other – you can judge what as well as I – he not only did not answer the question, but very carefully avoided all allusion to it! … It is quite probable that the Judge will make other speeches in different localities, and as it is possible that he forgot to answer the question above given, it may be well to hand it up to him again and again, until he shall have found time to answer it. This is a version of what is known as the “Freeport Question”, because Lincoln asked it of Douglas in their debate at Freeport, Illinois on August 27, 1858. Supposedly it backed Douglas into a corner. His doctrine of popular sovereignty held that the people of the territories could decide whether to permit slavery or not. On the other hand, the Dred Scott decision said that slavery could not be prohibited in any territory. If Douglas says that the people of a territory can exclude slavery, he pisses off the South, which he wants to hold onto for the presidential election of 1860. If he says they can’t, he pisses off the North, specifically Illinois voters. According to McPherson, in Battle Cry of Freedom, this is “folklore history”. Douglas knew the question would come; it was obvious that he had to balance his appeal to Free Soil and pro-slavery elements in the Democratic party, and he had already made his answer known. In fact, Lincoln knew what his answer would be already. McPherson quotes a July 31, 1858 letter from Lincoln to Henry Asbury: “He will instantly take ground that slavery can not actually exist in the territories, unless the people desire it, and so give it protective territorial legislation. If this offends the South he will let it offend them; as at all events he means to hold on to his chances in Illinois … he cares nothing for the South – he knows he is already dead there”1. In the debates and after, Douglas repeatedly took this position: Although slavery could not be legally excluded from the territories, it could not thrive in them without legal and societal protection, so in practice the people of the territories have the power to decide whether it would exist there or not. As we have seen elsewhere, the South was indeed dead-set against Douglas by 1860. His opposition to the Lecompton constitution in Kansas sealed his fate with slave-owners. Unlike Breckinridge, he wouldn’t support a federal slave code that would enforce slavery in the territories. So why would he have been so reluctant to answer the Freeport question in Maine, when he’d already answered it in Illinois? It’s hard to know. The Tribune is biased. It may be that the correspondent is either exaggerating or just making it up. On the other hand, it could be that Douglas was trying not to let the issue come up again, hoping that public amnesia would help him in the South. But what if Douglas, as claimed elsewhere, was by this point just trying to keep the Union together? His best bet was to throw his support to the general “anti-Lincoln” camp, hoping to draw enough votes so that nobody would get a majority in the electoral college. The House would then likely elect Lane, and the South would stay in the Union. In this case, he’s ducking the Freeport question just to try to keep the focus away from slavery entirely, as that’s what splits the Democratic party. It seems that if the “Freeport question” story is “folklore”, it was folklore that developed within less than two years after the original debate. McPherson may be right that the question had already been answered, but it appears that the public did perceive the Freeport question as a dilemma for Douglas. It’s probably important to remember that the public is not always perfectly logical when it comes to politics, and even issues that have been clearly settled may be perceived as controversial by some people. Where was Obama born? 1McPherson, James M. Battle Cry of Freedom: The civil war era. Oxford: Oxford University Press, 1988. 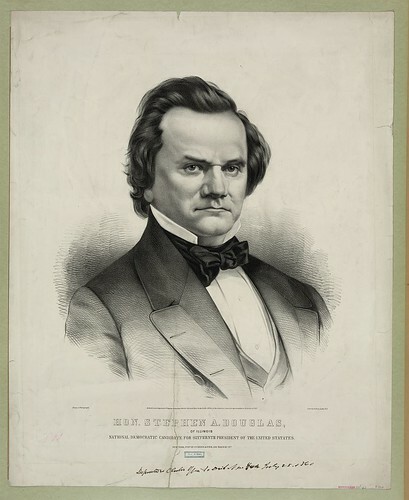 This entry was posted in Abraham Lincoln, Slavery, Stephen A. Douglas, Uncategorized. Bookmark the permalink.